Background and objectives: The optimal treatment of secondary hyperparathyroidism in chronic kidney disease (CKD) is unknown. Design, setting, participants, & measurements: We conducted a randomized, blinded, 3-month trial in vitamin D-deficient CKD stage 3 and 4 patients with parathyroid hormone (PTH) values above the Kidney Disease Outcomes Quality Initiative target, comparing cholecalciferol (4000 IU/d × 1 month, then 2000 IU/d; n = 22) to doxercalciferol (1 μg/d; n = 25). Results: There was no difference in baseline demographics or lab tests, except a slightly higher estimated GFR (eGFR) in the doxercalciferol group. 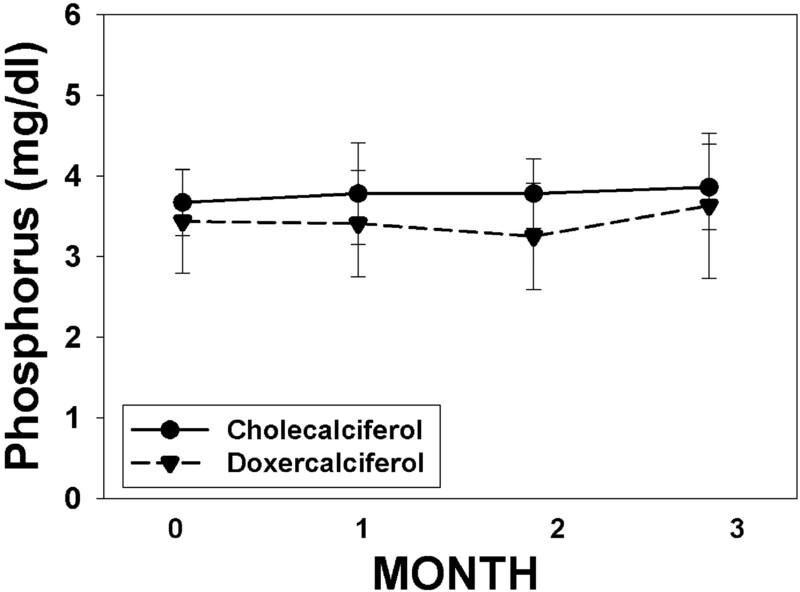 There was a significant increase in vitamin D level in the cholecalciferol group (14 ± 6 to 37 ± 10 ng/ml; P < 0.001) but no change in the doxercalciferol group. The PTH decreased by 27% ± 34% in the doxercalciferol group (P = 0.002) and decreased by 10% ± 31% in the cholecalciferol group (P = 0.16), but the difference between treatments was NS (P = 0.11). Similar results were found when absolute PTH change from baseline to end point was analyzed in a repeated-measures ANOVA model. The serum calcium and urine calcium excretions were not different. Additional non-mineral-related end points, albuminuria, and BP were evaluated, and although trends were present, this did not reach significance. Conclusions: This prospective, randomized trial demonstrated a within-group reduction in PTH in the doxercalciferol-treated patients but no significant difference between the doxercalciferol and cholecalciferol patients. Larger, long-term studies are needed to demonstrate efficacy of mineral-related and non-mineral-related end points and safety. In patients with chronic kidney disease (CKD), vitamin D insufficiency and deficiency are more common than in the general population. In the Third National Health and Nutrition Examination Survey data set, the adjusted odds for vitamin D deficiency increased 32% in patients with CKD (1). In a cross-sectional study of 178 subjects with CKD from the United States, only 29% and 17% of patients with CKD stages 3 and 4, respectively, had sufficient vitamin D levels (2). Furthermore, the prevalence of subjects with frank deficiency (<10 mg/ml), 14% and 26% in stages 3 and 4 CKD, respectively (2), was dramatically different compared with the general ambulatory population based on the Third National Health and Nutrition Examination Survey data (3). Several other investigators have similarly found widespread vitamin D insufficiency in CKD, although not all investigators have identified a relationship with CKD stage (2,4–6). Vitamin D deficiency is associated with increased parathyroid hormone (PTH) (2,4,5,7,8) and also associated with low bone mineral density in CKD patients (8) and dialysis patients (4). In a large cohort study, black subjects had lower levels of calcidiol and higher levels of PTH than white individuals, despite having higher levels of calcium and phosphorus (9). In the general population, vitamin D deficiency induces secondary hyperparathyroidism, and the definition of sufficient vitamin D status is often assigned on the basis of the level at which PTH normalizes (10,11). However, unlike the general population, the pathogenesis of secondary hyperparathyroidism in CKD patients is complex and due to not only vitamin D deficiency but also calcitriol (1,25(OH)2D) deficiency, positive phosphorus balance, and skeletal resistance to the effects of PTH. Furthermore, elevations of fibroblast growth factor 23 can reduce PTH secretion, aggravating this complex pathophysiology (12). Initial therapies to suppress PTH in CKD more than 30 years ago were with calciferols, nutritional vitamin D supplements such as cholecalciferol and ergocalciferol. At the time, it was presumed they would be of limited effectiveness because they needed conversion in the kidney to the active form of vitamin D, calcitriol. With the advent of pharmaceutical preparations of calcitriol, the standard of care became treatment with these so-called active vitamin D preparations. Although these were effective in lowering PTH, hypercalcemia was observed, leading to the development of “less calcemic” vitamin D analogs designed for superior efficacy at suppressing PTH and for minimal intestinal calcium absorption effects. However, recent data indicate that cholecalciferol or ergocalciferol can still be metabolized into calcitriol in the absence of kidneys by nonrenal sites of CYP27BA (1-α-hydroxylase) activity (13), including in the parathyroid gland (14). The Kidney Disease Outcomes Quality Initiative (KDOQI) and Kidney Disease Improving Global Outcomes (KDIGO) clinical practice guidelines recommend evaluating patients with secondary hyperparathyroidism in stage 3 and 4 CKD for vitamin D deficiency and treating when identified (15,16). However, no prospective randomized trials have evaluated this approach or compared it to “active” vitamin D sterols, such as calcitriol, doxercalciferol, or paricalcitol. We report the results of a randomized controlled trial of 3 months' duration that compared high-dose cholecalciferol to doxercalciferol for the treatment of secondary hyperparathyroidism in patients who were vitamin D-deficient. We tested the hypothesis that active vitamin D therapy is a superior therapy to calciferol supplementation for the treatment of secondary hyperparathyroidism in patients with CKD stages 3 and 4 who are calcidiol-insufficient. To test this hypothesis, we conducted a randomized, prospective, single-blinded study to directly compare these two therapeutic approaches. The inclusion criteria were age of 18 years or older, male or female, CKD stage 3 (GFR 30 to 59 ml/min) or stage 4 (GFR 15 to 29 ml/min) by the four-parameter MDRD (Modification of Diet in Renal Disease) formula; intact PTH >100 pg/ml for stage 3 or PTH >150 pg/ml for stage 4; calcidiol (25(OH)D) levels ≤20 ng/ml; and ability to sign informed consent. Exclusion criteria were intact PTH >400 pg/ml; corrected calcium >9.7 mg/dl; serum phosphorous >5.0 mg/dl; standardized BP higher than 160/100; history of significant liver disease, cirrhosis, malabsorption, severe chronic diarrhea, or ileostomy; anticipated requirement for dialysis in 6 months; and use of calcimimetic or vitamin D therapy 30 days before enrollment with the exception of vitamin D in a multivitamin. Subjects were randomized in blocks of four, stratified by CKD stage. They were then assigned to cholecalciferol (4000 IU daily in the form of two 2000-IU pills for the first month followed by 2000 IU daily in the form of two 1000-IU pills for the next 2 months, both from Carlson Laboratories, Canada) or doxercalciferol (0.5 μg, two tablets daily; purchased from a clinical pharmacy and manufactured by Bone Care International, Milwaukee WI, and then Genzyme Inc., Waltham, MA as two lots were needed). Both pills were small, orange-shaped capsules nearly identical in appearance, with the exception of the “Bone Care” logo on the doxercalciferol tablets. The pills were administered by the investigational pharmacist such that the investigative team (principal investigator and coordinators) was blinded. By nature of the nearly identical color and shape of the pills, the patients knew they were receiving vitamin D and were likely unaware of assignment. The dose of doxercalciferol was chosen based on initial dosing recommendations in the Food and Drug Administration-approved package insert. After the initial baseline/screening blood tests, calcium, albumin, and phosphorous levels were drawn at each follow-up visit. The protocol called for additional testing if the calcium levels were greater than 10.7 mg/dl or phosphorous >5.5 mg/dl, but no subject required such testing. Vitamin D levels (68100 radioassay; DiaSorin, Stillwater, MN) were done at baseline and end point, and intact PTH (26100 immunoradiometric assay; DiaSorin) was done at each visit. No patient had an albumin level less than 4 mg/dl, so the calcium was not corrected for albumin. Random urine samples were collected for urine calcium and creatinine. The vitamin D, PTH, and urine samples were immediately frozen and analyzed at the end of the study in batches to minimize run-to-run variability. In addition to the mineral-related end points, we also evaluated non-mineral-related end points, including BP, microalbuminuria (assayed using the 24-MABHU-E01 ELISA kit; ALPCO, Salem NH), and quality of life by SF-36 Health Survey (QualityMetric Inc., Lincoln, RI). The home BP was obtained from sitting BP readings using the Omron 432 C BP cuff in the arm with the higher clinic BP once in the morning, afternoon, and evening for three readings a day, performed over 7 days. The first day's readings were discarded, and the remaining readings were combined for an average reading, using a minimum of nine readings (17). The Omron 432C has been validated by the protocols of the Association for the Advancement of Medical Instruments and the International Protocol of the European Society of Hypertension. Standardized clinic BPs were obtained at every clinic visit by having the subject sit in an upright chair for at least 5 minutes, with no caffeine or tobacco products having been consumed within the prior 30 minutes. Three measurements were obtained from each arm separated by 30 seconds, and the averaged two readings (one from each arm) were recorded (18). To determine whether there was an improvement in quality of life, functional status, and overall pain level, an SF-36 questionnaire was administered at the beginning and then at the end of the study. The SF-36 questionnaire has been validated and is a frequently used tool in assessing quality of life in CKD (19). The purpose of this study was to determine the differences in the short-term (3 months) efficacy of the cholecalciferol versus doxercalciferol as a pilot study, anticipating that a larger long-term study would ultimately be needed. Because there are no published randomized trials, the initial sample size was based on the published response to doxercalciferol versus placebo (20), where a 46% reduction in PTH was observed over 6 months, with a 51% SD. The expected reduction in PTH with cholecalciferol was based on best-case scenario decrease of 17.8% in PTH with ergocalciferol from our own clinic setting. To obtain a power of 80% and alpha of 0.05, we calculated that we would need to enroll at least 29 subjects per arm (58 total), which with 20% dropout would be a final of 23 per arm. Patients' baseline characteristics were summarized by treatment group, and results are presented as mean ± SD throughout the manuscript for continuous variables and frequency for categorical variables. The primary end point was the percent change in PTH (from baseline to end of study) between the treatments determined by two-sample t tests. Differences of absolute laboratory results between treatment groups at baseline were also compared by two-sample t tests or Pearson χ2 tests for continuous and categorical variables, respectively. The changes from baseline to end of study were tested using paired t tests. To study the treatment effect difference, we also fit the repeated-measurement ANOVA model with baseline and end of study measurements as response variables, and treatment, visit, and their interaction as covariates. This analysis was performed using last observation carried forward under the intention-to-treat principle. With data of many urine and blood measurements from four visits, we also fit linear mixed models of measurements (of PTH, calcium, phosphorus, and vitamin D), including data from all four visits. A random intercept was used to measure the correlation of longitudinal observations from the same subject. With only four visits, the time (or visit) effect was modeled categorically for each visit to allow for flexibility of the time trend. To further evaluate the treatment effect difference between CKD stages, we employed two-way ANOVA models with percentage of change (of PTH), calcium, phosphorus, and 25(OH)D as response variables, and treatment, CKD stage, and their interaction as the factors. All of the analyses were performed using SAS 9.1. Patients were enrolled from 2005 to 2008. Fifty-five patients were randomized, 47 of whom had at least one follow-up visit after taking medication and were subsequently analyzed. Of these 47 individuals, 22 were assigned to receive cholecalciferol, and 25 were assigned to receive doxercalciferol. Table 1 shows the baseline patient characteristics by assigned treatment group. The only difference in the treatment groups at baseline was a higher GFR in the doxercalciferol group (36.4 ± 10.7 versus 29.6 ± 7.4 ml/min; P = 0.02). As expected, at baseline, patients with CKD stage 3 had higher eGFR (38.8 ± 7.6 versus 24.9 ± 2.3 ml/min; P < 0.001), lower mean arterial pressure (MAP; 95.3 ± 11.0 versus 107.5 ± 7.9 mmHg; P = 0.01), lower serum phosphorus (3.4 ± 0.6 versus 3.8 ± 0.4 mg/dl; P = 0.006), and a trend toward a lower intact PTH (97.8 + 45.8 versus 121.9 ± 35.5 pg/ml; P = 0.06), but no difference in vitamin D levels (14.6 ± 5.5 versus 14.6 ± 6.3 ng/ml; P = not significant). There were no differences between black and white subjects in baseline values. When the patients completing the entire study were compared with those who did not complete the study, the only difference was in the standardized MAP: those who completed the study had a MAP of 95 ± 11 compared with 108 ± 8 (P = 0.01). Monthly pill counts were done, demonstrating equivalent compliance: 87.5% ± 10.7% of pills taken in the cholecalciferol arm compared with 82.3% ± 16.8% in the doxercalciferol arm (P = 0.31). The PTH decreased by 27% ± 34% in the doxercalciferol group (P = 0.002) and decreased by 10% ± 31% in the cholecalciferol group (P = 0.16), but the difference between treatments did not reach significance (P = 0.11). The actual values for baseline and end of study results for the various mineral-related laboratory tests are shown in Table 2 by treatment group. As expected, there was a significant increase in the vitamin D level in those randomized to receive cholecalciferol (14.0 + 6.1 to 37.2 ± 10.1 ng/ml; P < 0.001) but no change in those who received doxercalciferol (P < 0.001 between treatment groups). Similar to the percent change, the value of intact PTH fell significantly over time only in the doxercalciferol group (106.5 ± 44.3 to 80.4 ± 48.6 pg/ml; P = 0.006). There was a nonsignificant decrease in PTH in the cholecalciferol group (108.7 + 42.7 versus 96.5 + 48.7 pg/ml; P = 0.15), with no significant difference between the two treatment arms (P = 0.19). These results did not change even when we used a linear mixed model to analyze data from all four visits (P value between treatment groups = 0.18). The change over time is shown in Figure 1. There was no correlation between the level of vitamin D and PTH at baseline (r = −0.29; P = 0.05) or end point (r = 0.01; P = 0.94) for the patients evaluated as a total group, nor by treatment arm. There was also no difference between the achieved vitamin D level in patients who did and did not see a decrease in PTH in those treated with cholecalciferol (33.1 ± 5.0 ng/ml in those with no change in PTH, compared with 36.6 ± 13.0 ng/ml). Percent change in PTH over time. The percent change in intact PTH levels over the course of the study is graphed for subjects treated with cholecalciferol (solid circles, solid line) and doxercalciferol (solid triangles, dashed line). The numbers of subjects for months 0, 1, 2, and 3 were 22, 22, 20, and 20, respectively, for the cholecalciferol arm, and 25, 24, 21, and 20 for the doxercalciferol arm. The subjects were stratified by CKD stage. When analyzed by CKD stage, the percent change in PTH for patients with CKD stage 3 was −15.9% ± 29.3% for cholecalciferol subjects (n = 12) and −25.1% ± 37% for the 13 doxercalciferol patients (P = 0.5 between treatment groups). For CKD stage 4, the percent change in PTH was −1.3% ± 33% in the seven cholecalciferol-treated subjects, but −30.3% ± 29.3% for the eight doxercalciferol subjects (P = 0.1 between treatment groups). However, two-way ANOVA analysis of percent change in PTH, with drug and stage of CKD and their interaction as factors, found no difference between the two groups (P = 0.37). There was also no difference in the increase in 25(OH)D levels in patients treated with cholecalciferol in stage 3 compared with stage 4. The changes in serum calcium and phosphorus levels over time in the two treatment groups are shown in Table 2 and Figures 2 and 3. There was a significant rise in calcium in the doxercalciferol-treated patients (9.1 ± 0.5 to 9.5 ± 0.9 mg/dl; P = 0.04) but not in the cholecalciferol-treated patients (9.0 ± 0.8 to 9.0 ± 0.6 mg/dl; P = NS). However, these changes were well within the normal range for serum calcium, and the difference between the two treatments did not reach significance (P = 0.15). Three patients developed hypercalcemia (defined as >10.5 mg/dl). All three were at the end of the study: two in the doxercalciferol group and one in the cholecalciferol group. There was no effect of either drug on phosphorus levels, nor any episodes of hyperphosphatemia (defined as >4.7 mg/dl). The urine studies showed very low Ca/Cr ratios in both groups at baseline (Table 2), and there was no change over time in either treatment group. Change in calcium over time. The change in calcium levels over the course of the study is graphed for subjects treated with cholecalciferol (solid circles, solid line) and doxercalciferol (solid triangles, dashed line). The numbers of subjects for months 0, 1, 2, and 3 were 22, 22, 20, and 20, respectively, for the cholecalciferol arm, and 25, 24, 21, and 20 for the doxercalciferol arm. Change in phosphorus over time. The change in phosphorus levels over the course of the study is graphed for subjects treated with cholecalciferol (solid circles, solid line) and doxercalciferol (solid triangles, dashed line). The numbers of subjects for months 0, 1, 2, and 3 were 22, 22, 20, and 20, respectively, for the cholecalciferol arm, and 25, 24, 21, and 20 for the doxercalciferol arm. We examined a number of non-mineral-related end points as exploratory measures. There was a decrease in the mean albumin/creatinine ratio in both treatment groups, although the large patient variability made this difficult to interpret and not statistically significant. However, if we examined only patients with macroalbuminuria (>300 μg/mg, n = 19 of 37 with complete pre-post collections), there was a 25% ± 67% decrease in the albuminuria ratio. Twelve of these 19 subjects had a decrease in their albuminuria, with no obvious difference between treatment arms. The BP readings (home, standardized, and MAP) were similar at baseline and end of study (Table 3) between the two treatment arms. There was, however, a trend toward a decrease in the home systolic BP in both treatments (cholecalciferol = 145 ± 20 to 128 ± 33 mmHg; P = 0.17; and doxercalciferol = 142 ± 15 to 120 ± 47 mmHg; P = 0.07) but not in the standardized measures. Given that the effect of vitamin D on BP may be similar with both treatments, we examined the change in BP for the entire group over time. These combined results demonstrated a significant decrease from baseline to end point for the home systolic BP (143 ± 17 to 124 ± 41 mmHg; P = 0.02) and diastolic BP (75 ± 12 to 66 ± 23 mmHg; P = 0.05) but not the clinic-obtained standardized BP. There was no relationship between the baseline or final MAP and laboratory findings, nor was there a relationship between the change in PTH or vitamin D and the change in BP. There was no difference in any of the eight quality of life indices on the SF-36 measured between treatment groups. In 2003, the KDOQI guidelines recommended that patients with CKD stages 3 and 4 with secondary hyperparathyroidism who were vitamin D-deficient should be treated with vitamin D to lower PTH (15), a strategy used in the general population (10,11). The rationale provided in KDOQI is that ergocalciferol or cholecalciferol was believed to be a safer and less expensive alternative to the use of calcitriol and its analogs. Our study represents the first randomized, controlled trial testing this rationale. We compared cholecalciferol to doxercalciferol for the treatment of secondary hyperparathyroidism in patients who were vitamin D-deficient, choosing cholecalciferol over ergocalciferol because of similar pill size and color and daily dosing to the doxercalciferol. The results demonstrated no statistically significant difference between the two treatments in lowering PTH in this randomized 3-month study. The data showed that although the doxercalciferol-treated patients had a significant lowering of PTH from baseline, there was also a trend toward lowering PTH in the cholecalciferol-treated patients. The separation of the curves (Figure 1) was only observed over the last month, when there was also a splay in the calcium curves. 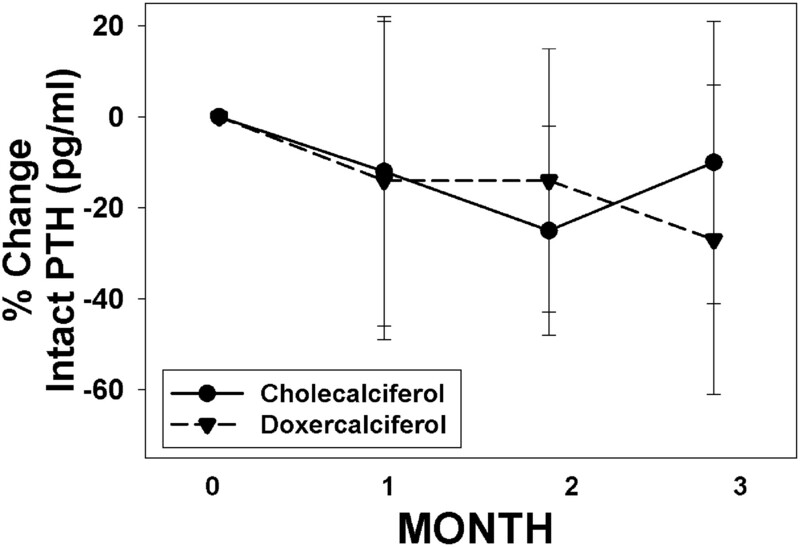 Although there was a slight increase in the serum calcium level and urinary calcium excretion level in the doxercalciferol-treated patients, suggesting increased intestinal calcium absorption, the levels remained well within the lower end of the normal range for both measures, and there was no significant difference between treatments. However, it remains possible that this magnitude of change in calcium may have led to the additional PTH suppression. Alternatively or additionally, the cholecalciferol-treated patients may have been less responsive because of a slightly but significantly lower eGFR. In our study, the PTH was lowered with doxercalciferol, but the reduction was less than in a previous 6-month placebo-controlled trial (20), perhaps because we did not titrate the dose in our study (and thus used overall lower doses) and because the subjects in the placebo-controlled study had higher baseline PTH values. As noted in recently published KDIGO guidelines, the optimal PTH in CKD stages 3 and 4 remains unknown (16), further complicating the management of hyperparathyroidism in these patients. The results of our study showing no difference between high-dose cholecalciferol and low-dose doxercalciferol in lowering levels in patients with only mild elevations in PTH in this short-term study provide the proof of concept to strongly support the need for larger, long-term trials with a placebo arm. Such a study should not only evaluate the efficacy in lowering PTH but also evaluate patient-centered end points to assess the long-term safety of potential differences in calcium metabolism between the two drugs. We also stratified by CKD stage and found that PTH lowering in response to cholecalciferol trended to be greater in stage 3 compared with stage 4 patients. However, using a mixed model, there was no significant difference, perhaps because of our small sample size and relative small differences in the GFRs between our stage 3 and 4 subject groups. Several uncontrolled studies have previously demonstrated that vitamin D supplementation in patients with CKD is effective at suppressing PTH in patients with CKD stage 3, although it is only marginally effective in patients with CKD stage 4 (21–23). In the study by Zisman et al. (22), approximately 7 months of ergocalciferol treatment in 52 patients with CKD 3 and 4, vitamin D levels <30 ng/ml, and elevated levels of PTH showed a similar increase in vitamin D levels that we observed in just 3 months: the mean 25-vitamin D levels achieved in patients with stages 3 and 4 CKD were 31.6 ± 2.2 ng/ml and 35.4 ± 1.9 ng/ml, respectively. A median decrease in PTH concentrations of 13.1% and 2.0% was noted in patients with stage 3 (P = 0.041) and stage 4 (P = NS) CKD, respectively (22), similar to our observed decreases in PTH in response to cholecalciferol: 16% in CKD stage 3 and no change in CKD stage 4 in just 3 months. Another randomized study of 10 subjects treated with cholecalciferol therapy 50,000 U/wk for 12 weeks versus placebo in subjects with CKD stages 3 and 4 reported a 31% increase in 25(OH)D levels to almost 50 ng/ml and showed a 31% decrease in PTH in the treated group compared with 7% decrease in the placebo group (P = 0.7). However, this was not statistically significant because of the high variability of PTH (23). Recently, Brown et al. found that both 1α(OH)D2 and D3 were hydroxylated in cultured parathyroid cells, and they suppressed PTH to levels approximately 10% of that of 1,25(OH)2D3 (14). These data suggest that ergocalciferol and cholecalciferol, once 25-hydroxylated in the liver, would have a direct effect on PTH suppression even in the complete absence of kidney 1α-hydroxylase activity. However, the clinical data suggest that residual renal function clearly augments the effects of cholecalciferol or ergocalciferol to reduce PTH. The optimal dose of vitamin D needed to achieve adequate serum levels is currently controversial. The current recommended dietary intake is 600 to 800 IU of cholecalciferol per day, and this is currently under debate by a panel convened by the Institute of Medicine. In the present study, we gave 4000 IU/d cholecalciferol in the first month, and 2000 IU daily for the next 2 months, with a clear increase in vitamin D levels. However, the vitamin D level that is “sufficient” is not clearly defined. A level of 30 ng/ml is often cited as sufficient because this is the level that is associated with a normal serum PTH level in the general population (10,11). However, this definition may not be valid in CKD, where there are multiple causes of hyperparathyroidism. In the present study, we achieved such a level of vitamin D with our dosing strategy (37.2 ± 10 mg/dl), but the achieved level of vitamin D was not different in those with and without PTH suppression. In non-randomized control studies of patients on hemodialysis in which cholecalciferol was given in doses of 400 to 4000 IU (10 to 100 μg), there was no change in intact PTH levels, although in one of the studies hyperparathyroid changes in bone improved with therapy (24). Thus, our data suggest that vitamin D levels of 30 ng/ml may not be adequate for PTH suppression, and the optimum level of vitamin D sufficiency may be different in patients with CKD compared with the general population. Importantly, these studies also demonstrate that doses of cholecalciferol of 2000 to 4000 IU/d are safe, despite using levels substantially above the current recommended daily dose of 600 to 800 IU/d. Over the last 10 years there has been an increased appreciation of nonendocrine (nonmineral) effects of vitamin D. We therefore examined BP and proteinuria, variables that are known to have an impact on the progression of kidney function, as exploratory aims to power future interventional studies. Not surprisingly, none of these end points showed statistically significant changes with either treatment, but there was a trend toward reduction of BP and albumin excretion with both cholecalciferol and doxercalciferol. Vitamin D deficiency is associated with albuminuria (25–27), and two pilot studies, one in 10 patients with IgA nephropathy (28) and one in 24 patients with CKD stage 3 (29), showed that treatment with calcitriol and paricalcitol, respectively, reduced microalbuminuria. Another secondary analysis found that urinary protein by dipstick was reduced in patients with CKD stage 3 and 4 treated with paricalcitol compared with placebo (30). A preliminary report of a much larger study, presented in abstract form at the American Society of Nephrology 2009 meeting, demonstrated that paricalcitol, compared with placebo, had favorable effects on lowering albuminuria in diabetic patients with CKD stages 3 and 4 (31). Clearly, larger studies are required to determine whether cholecalciferol or doxercalciferol may have a similar effect. The data for BP are also intriguing but not consistent. A prospective trial in elderly patients found that calcium plus 800 IU/d cholecalciferol compared with calcium alone given for 8 weeks led to a 9.3% decrease in systolic BP (32). However, a secondary analysis of the Women's Health Initiative study demonstrated no relationship of vitamin D administration with a reduction in BP, but it used much lower doses of vitamin D, and the compliance was not maintained over the course of the study (33). In our study, we found that the majority of patients with macroalbuminuria had a reduction, regardless of which drug they received. Similarly, there was a reduction in the home BP readings but not standardized clinic BP, regardless of which drug they received. The home BP was the average of BP taken over a 1-week period, and it is generally considered to correlate best with overall BP assessed by ambulatory monitoring (17). However, we did not have a placebo arm in this study, and thus we cannot determine whether this was a study effect or a true drug effect. Clearly, long-term and larger studies with a placebo arm are required before we conclude that any form of vitamin D may improve either hypertension or albuminuria. Nonetheless, the results are intriguing given the importance of reduction in BP and albuminuria in retarding the progression of kidney disease. Our study has several limitations. First, the study was small and of only 3 months in duration, and it was primarily conducted to provide sample size calculations for a larger, long-term study and to determine optimal dosing of cholecalciferol. Importantly, much higher levels of vitamin D, or sustained levels, may be needed to observe PTH lowering in CKD, and/or longer treatment with either drug may show unwanted side effects, such as hypercalcemia, oversuppressed bone turnover, or vascular calcification. Second, we did not have a placebo arm, which may have revealed that both cholecalciferol and doxercalciferol were more effective than placebo for both mineral and nonendocrine effects. Last, the effect of PTH lowering in CKD stages 3 and 4 has not been demonstrated to have an impact on patient level outcomes, and the optimal level of PTH remains unknown (16). Although we tested the approach recommended by KDOQI guidelines, a similar approach is recommended in KDIGO clinical practice guidelines: “In patients with CKD stage 3 and 4 who have a rising PTH level and are vitamin D deficient, a trial of repletion of vitamin D is suggested before use of calcitriol or vitamin D analogs” (16). Our data support that this approach is reasonable given the safety profile but that long-term, randomized trials are clearly indicated to truly assess the benefit-risk profile. Dr. Moe is a consultant and has grant support from Genzyme, the manufacturer of doxercalciferol. When the study was started, it was manufactured by Bone Care International. Genzyme had no role in the funding, conduct, or analysis of the data. The authors wish to thank Drs. Richard Hellman and Sharon Karp for assistance in recruiting subjects for the study, and research coordinators Karen Graves, Michelle Murray, Lilly Qian, and Cynthia Taylor, who assisted in the conduct of this study. This study was supported by the National Kidney Foundation of Indiana and the Indiana Clinical and Translational Sciences Institute, Indiana Clinical Research Center, National Institutes of Health grant UL RR025761. Dr. Moe is also supported by National Institutes of Health grant DK002775 and the Veterans' Administration.